PART TWO of my Ultimate Thanksgiving Prep Series includes the recipes for my Cranberry Citrus-Cider Sauce and a cold Green Bean and Shallot Salad with Champagne Cider Vinaigrette. This is a two-for-one post. Yes. You get both recipes here in an effort to not turn this into a ten part series. I know. You do not have to thank me. I just like you all that much and want to keep your lives as simple as possible. It is truly one of the easiest parts of the entire meal. It makes your home smell amazing while it is simmering. You can make it the day before the meal since it actually gets even better as it sits. And best of all, your guests will love it and think that you worked really hard on it (let them think that – do not blow your cover). 1. 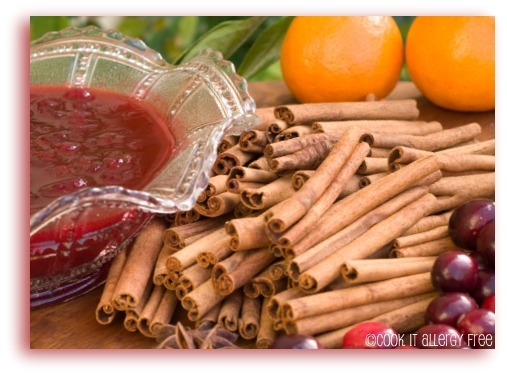 In large sauce pan, add zest of oranges, juice of oranges, cider, cranberries, brown sugar, maple syrup, ground cinnamon, and cinnamon stick. 2. Bring to a boil over high heat, stirring occasionally. 3. Reduce heat to medium and simmer uncovered for 7 – 10 minutes, or until most of the cranberries pop, still stirring occasionally. 4. Once most of the cranberries have popped, remove from heat and allow to cool. Remove cinnamon stick. Then spoon mixture into serving bowl and refrigerate until well-chilled (about 3 hours or up to 3 days). Mixture will thicken as it chills. Now for this Green Bean and Shallot Salad with Champagne Vinaigrette. 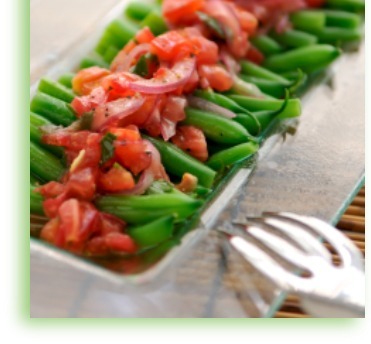 You can also use Haricots Vert for this salad. An exotic twist? Ahh…but no. They are really only a longer thinner French cousin of our typical American green bean. But does it not just sound so much fancier to say you are serving Haricots Vert and Shallot salad (instead of plain ole’ green beans)? Okay, since there is not too much you can say about a Green Bean (excuse me, Haricots Vert) and Shallot Salad, let us get on with the recipe. After all, you probably are juggling the Thanksgiving meal right about now and you do not have time to read some witty banter about a silly salad. 2. Bring a 1/2 inch salted water to boil in a large saute pan. Add green beans, cover, and cook until green beans are tender to the bite and water has evaporated, 3 – 4 minutes (depending on your desired crispness). 3. Immediately plunge green beans in ice water to completely cool and stop cooking process. Dry thoroughly. Then place green beans and chopped tomatoes in serving bowl. 4. Combine shallots, vinegar, and salt in another bowl and then gradually whisk in sugar and oil. Add basil. 5. Pour enough dressing over beans and tomatoes to coat. 6. Mix in 1/4 cup of cheese (if Dairy-free, omit entirely, or use Parma, if not Nut-Free), and season with any additional salt, to taste. 7. Cover and chill. Can be made up to this point the day before. 8. Before serving, just top with remaining ¼ cup cheese (unless Dairy free -then omit entirely, or use Parma, if not Nut-Free). PART 4: The Gluten-free Cornbread and Crusty Bread Stuffing I have been promising (and trust me, you will not want to leave out the secret ingredient). PART 8: The Recap, with links to everything. Yum! I love to see a new twist on green beans! The dressing sounds fantastic, though I’ve never heard of champagne vinegar and will have to look for it. I also like the looks of your cranberry sauce. I love cranberry sauce! And I love apple cider – we’re lucky to get it weekly for most of the winter at our year-round farmer’s market! Although I won’t be doing the American thanksgiving thing (unless you invite us down), I will come back and try these at Christmas! Hi Maggie! Consider yourself officially invited to our Thanksgiving meal. And, you have to try champagne vinegar. I think it gives such a nice flavor to vinaigrettes!! And lucky you to get fresh Apple Cider at your farmer’s market all the time! Yum! One should not mock the use of witty banter. I make a cranberry sauce every year, same as I always have. However, this one looks FANTASTIC! I can’t wait to try this instead! YUMMY! 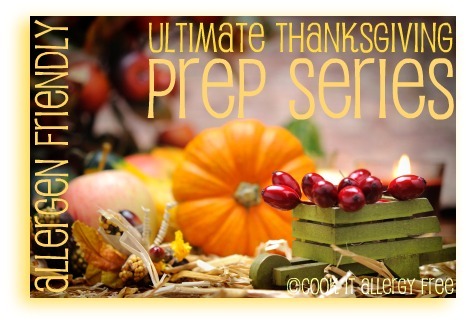 Thanks for all these great prep tips! Ahh, thanks Melissa! Your roasted green beans with tomatoes and kalamata olives sounds amazing. Is that one on your blog? What a bummer that you do not have a Trader Joe’s near you. They have a pretty good selection of gluten-free items, but it is their prices that I love the most! Those both look gorgeous! Definitely not living without anything with Thanksgivng dishes like these Kim! Shirley, I had to laugh out loud, literally, when I read what you wrote about taking away my cider or ACV. I have a serious addiction apparently. Maybe I should change the name of my blog to Cook It with Apple Cider. hehe. After chasing Max around for a few hours, I finally got to the next post. Oh, and I really want to try that cranberry cider. Saw it this weekend while grocery shopping. Perhaps in the cranberry sauce this year? Okay, Tia, the correct pronunciation of Hericots Verts is: ah-ree-koh VEHR. Lizzy, so so sad that you will not be here. Suzy and Katie and I are trying to plan a little adult-only holiday party when you come at Christmas, maybe at my house. I hope you and Dave have a wonderful Thanksgiving…I think you’ll like the cranberry sauce. We will totally miss you but look forward to seeing you in December!